20.9.1917: Launched by Cook, Welton & Gemmell Ltd, Beverley (Yd.No.375) (non-standard “Castle” class) for The Admiralty as JOHN ANDERSON (Ad.No.3610). 19.12.1917: Completed. Fitted with 1-12pdr and hydrophone. 27.10.1920: Registered by The Admiralty as a fishing vessel at London (LO480). 1922: Sold to Saint Andrew’s Steam Fishing Co Ltd, Hull (Charles F. Foster, manager). 27.11.1922: Registered at Hull (H760). 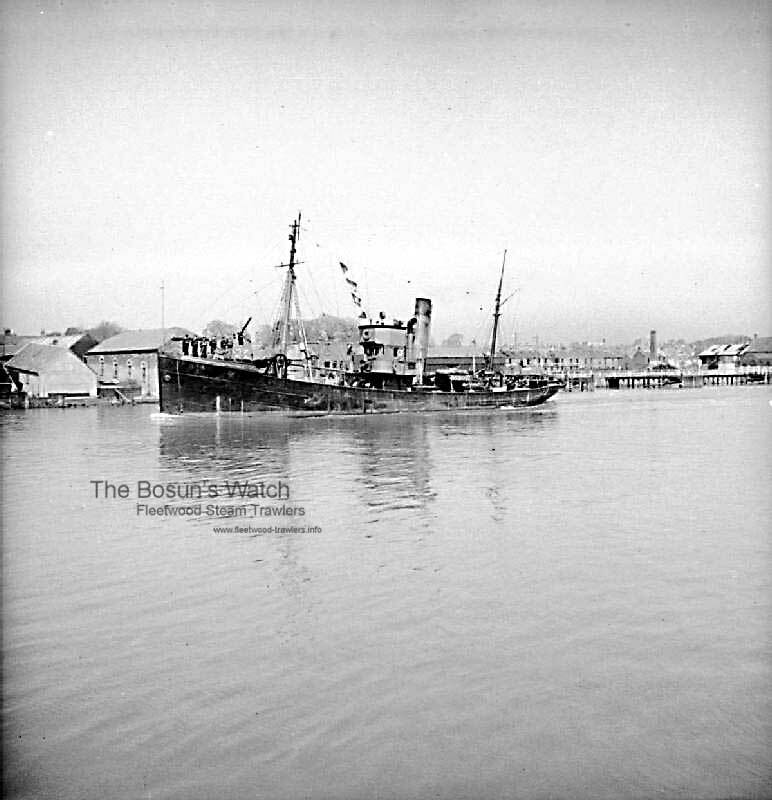 9.5.1931: Failed to refloat, tug IRISHMAN (222grt/1929) in attendance. 12.5.1931: Refloated and proceeded to Hull under own power. 1932: William H. Patterson appointed manager. 29.7.1937: Last landing at Hull (Sk. Harry Howard), fifteen days Faroe grounds 332 kits £293 gross. Transferred to fish out of Fleetwood. 7.12.1937: Sold to A. M. Morrice, Aberdeen. 14.12.1937: Registered at Aberdeen (A460). 1.1940: Sold to Saint Andrew’s Steam Fishing Co Ltd, Hull (Basil A. Parkes, Cleveleys, manager). 5.2.1940: Requisitioned for war service as a minesweeper (P.No. FY597) (Hire rate £79.12.6d/month). 19.8.1941: Sweeping with other trawlers (Sk. R. R. Snape RNR), engaged and shot down a Junkers 88. 16.11.1945: Returned (Basil A. Parkes, Cleveleys, manager). 1946: Sold to A. J. Tilbrook Ltd, Milford Haven. 1948: Sold to Sydney Bennett, Fleetwood. 1949: Sold to Medway Fishing Co Ltd, Fleetwood (Merchants (Fleetwood) Ltd, managers). Aberdeen registry closed. Registered at Fleetwood (FD275). 23.10.1952: Sheltering in Broad Bay, Isle of Lewis (Sk. Charlie Robinson). At 3.00 am in total darkness, steam trawler Wyre Law (FD48) (Sk. George Wood) stranded in the bay and immediately started to flood in the stokehold. Boat launched and siren sounded. Hearing the distress siren, weighed anchor and moved in close to enable survivors to be taken onboard from the boat. Crew landed at Stornoway. 1954: On sale of Merchants (Fleetwood) Ltd, to Associated Fisheries Group, Sydney Bennett, Fleetwood appointed manager. 1957: Sold to BISCO and allocated to Thos. W. Ward Ltd, Sheffield for breaking up. 17/01/2009: Page published. 6 updates since then. This entry was posted in Steam Trawlers, Steamers (Picture) and tagged Castle, Medway FC Ltd, Parkes, Sydney Bennett on January 17, 2009 by Fred Smith.